I'm An African Playwright and I'm Cool Like That! One of the perks of being an arts journalist is the very fact that you get to see theatre productions, exhibitions, gigs among many other things and you go for free. For me, that's great but the freebies aside, I appreciate when a theatre production has substance to it. Lately, I have enjoyed the very fact that my passion for African theatre has been re-ignited. I have seen some great productions this year. From Iya-Ile at the Soho theatre to Wole Soyinka's, Death and The King's Horsemen at the National. 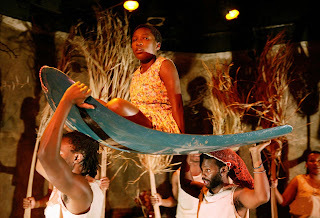 It has been a big splash of African theatre on the British theatre landscape. Even the Independent newspaper acknowledged that it was cool to do African theatre. 'Out of Africa: Award-winning African plays find a new home in British theatres' Give it Up! It isn't the accolades or recognition that has me rooting for African theatre. I would like to interject at this point and tell you that I am a very proud African lady living in London. So, let's continue. What has re-ignited my passion is the very fact that we are telling our stories, we are able to laugh at ourselves, our nuances and idiosyncrasies. At the same time, we are creating platforms to have a debate and discussion about the motherland. We are taking a mirror and putting it up to examine the good, the bad and the ugly and please don’t forget the struggles. I saw Bad Blood Blues at Theatre Royal, Stratford. It was a production about the HIV anti-viral trials in Africa and the load of horseshit bureaucracy that goes into who gets the anti-vial and who gets the trial drug and who gets nothing at all. I had to ask myself, how important is an African life compared to other parts of the world when it comes to tackling the HIV/Aids virus? Karoo Moose by Lara Foot-Newton, a South African playwright was so good; I remember using the word 'Ingenious' when the birth of a child was depicted by a young lady coming out of a drum. It was so symbolic and at the same time powerful. It was traditional theatre full of magical realism at its best and there was no dull moment. Death and The Kings Horsemen by Wole Soyinka was outstanding. My history was on stage and it was great that they kept it very traditional. Nothing like talking drums to make you sway from side to side. I could go on and on about the shows I have seen this year but I'm sure you might think, okay, go on, say what you really want to say. So, here it is. It is okay to write about African theatre and not be afraid of expressing what you feel or want to say about being African. I know some writers are nervous when they start out about boxing themselves but today, a young African dramatist told me in the course of an interview, I am an African Playwright. I was impressed by that. Often, you get some saying, I am a playwright full stop. And yes, that is valid also because labels do stick. But there is nothing wrong with it if you decide to be identified by your heritage and body of work. After all, you are writing about Africa and Africans in the diaspora. So, why can't we call you an African Playwright? If there is a theatre production you must see in your lifetime, it is Wole Soyinka's, Death and The Kings Horsemen. Hailed as one of his best masterpiece, this is a play every playwright, theatre director and theatre students must see for its ability to break the barriers of race, language and cultural boundaries. It is a play that does what theatre does best, bring oneness to the audience though we speak different languages. It brings one truth though we come from different social and cultural backgrounds. It speaks one word and says we are one though we are different. Yet we have an understanding of what transpires on the stage as we look on. Soyinka reiterates that we are indeed responsible for our fate in life. The first time I came across the book by the same title, I was rather saddened by the story. It is still on my Amazon wish list of books to buy and read. However, I have not been able to get round to reading the book despite promises to do so. So, imagine how excited I was when I heard it had been adapted for the stage. So far, the reviews have been great and I can't wait for the experience. These are the type of stories I love to see on stage. When a great injustice is brought to life and tackled head-on. This is one of the reasons I love the stage. The characters tell you their stories. You are not being spoon-fed but they are telling it like it is and leaving it to you, to draw your own conclusions. It has been described as a shocking and engrossing story. Now, I hope it lives up to expectations because I am seeing it on Saturday. Yippee!!!! I am not keen on productions that try to solve all of our love problems. Some of them get lost and others...just have no head or tail. That's not to say a few have not managed it. But when a play is focused on how to find 'The One' then that worries me because it might just be a waste of my time. Where is My Desi Soul Mate? A new production by Rifco Arts is the first play I have seen this year. I was not expecting the gritty realism of ‘Township Stories’ or the poetic language of Shakespeare or the animation you get when watching John Kani on stage. I just wanted to get into a theatre, sit down and see some characters on stage tell me a story. Okay, not the most gripping production but it made me laugh. For the one hour I was in that theatre, I forgot about the fact that I was turned down for a job a few hours earlier, despite being so upset before I got there. It didn’t matter that my feet was hurting like hell due to the heels I had on. I had left everything at the door and settled down for these characters to tell me their stories. Funny at some points and a little slow at others but it was okay. I saw someone else cry and they made me laugh. That’s the beauty of theatre, you forget your struggles for an hour or more as you get immersed into the story. My friend once described going to the theatre as going to creative church with the exception that you don’t get to holler and scream because you are not hearing a sermon. I had forgotten what it was like to sit back and let other people tell you a story you know nothing about. I have really missed that. I must start going out again. I need to get a feel of what the London audience is happy to pay for. Most of all, I need others to challenge my creative mind so I can get my creative juice flowing again. I’m back in town and so it is. I don't know about you but when I have been away from something for a while it takes a lot of courage and effort to get back into it. Hence, one of the reasons I get so nervous when I have to put anything I’m passionate about on hold. But that’s what I have done for the last 6/7 months. Was keen to learn about a different part of life and work, so I put my writing on hold…don’t get me wrong, I wrote something everyday, my journal, for my eyes only, my rants and musings blog page (every now and gain) letters, articles… you name it. I was writing but not working my creative juice as far my playwriting was concerned. Opened the last play I was working on this morning and I went blank. I just froze in time because I got scared that I didn’t know how to write anymore. Alan Ayckbourn, where are you??? I need help. Where is your book, The Crafty Art of Playmaking? I need to read that again. Susan Lori-parks, where are you? I am getting my copy of TopdogUnderdog out and I mean right now. Help!!!!!!!!!! I am really looking forward to writing again but at the same time scared that I may not know how or may not get it right. I want that skill which got me a firs class for playwriting at university back. The question is how do I get it back??? My intuition tells me, Belinda, just WRITE! Write and write because that’s the only way you are going to get back into it and get better. I also need to get out and see more plays. I can count the number of productions I have seen recently and it is dismal. I won’t tell you. But I am going to sit down and write. I am going to go out and see more plays. I am coming back home and I don’t care if the butterflies are dancing in the pit of my stomach. I don’t care if I get nervous. I don’t care what the first few feedbacks are going to be like. I am going to write and just keep writing until I get better. It is a process and here is to my homecoming.